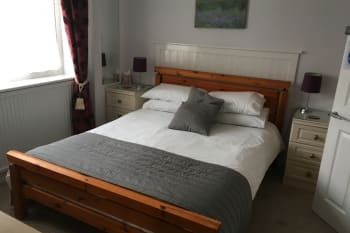 Situated at the heart of the Forest of Dean, our modern spacious bed and breakfast accommodation is an excellent guest base for tourists wishing to explore the area or for business travellers. We are located between Chepstow and Gloucester, at the edge of the village of Yorkley, within easy reach of Cheltenham, Bristol, The Cotswolds, South Wales and the Wye Valley. The house faces west for spectacular sunsets and great forest views, ideal for photographers, artists, families, couples seeking a romantic getaway or just for anyone wishing to get away from it all. We have a double room with spacious private bathroom with huge bath for two and a king size room with annexe room with en-suite shower room and superb views. Wi fi is free (broadband). Enjoy your freshly cooked or continental breakfast looking out over the fantastic views. 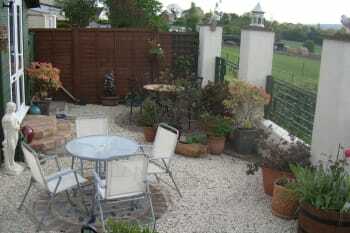 There is a private courtyard garden for guests and free parking. 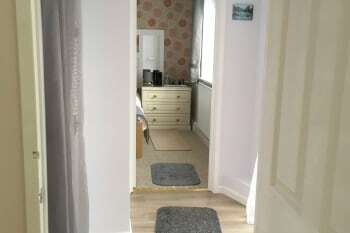 Great location, well appointed room with en-suite, superb breakfast, extremely comfortable bed and very friendly host. Highly recommended. Warm and friendly guest house offering excellent accommodation and facilities. Ideal base from which to explore the local area including the Forest of Dean and South Wales. Definately would recommend to anyone staying for activities as the owner was very helpful in giving us information about things to do and where. Another great stay with Helen.There is a lovely view as the name suggests!The room has everything you need- tea-making facilities (with yummy biscuits), hairdryer, iron and board, DVD player and choice of films. The beds are clean and comfy. There is also a fridge for use. Breakfast is great with all the usuals. There is plenty of parking.We will return! First rate in all respects. The Dean Forest Railway is excellent,and there are many attractions within a few miles. Lovely place to stay unfortunate about the noisy neighbors in the next room. Superb stay. Helen was most hospitable and provided us with everything we needed; great accommodation, great panoramic view, delicious cooked breakfasts and a comprehensive information folder of things to do and see, etc. Peruse the information folder provided by the host for day trips, maps for local forest walks, etc. Aptly named. The view from the property was breathtaking! A friendly welcome. The room was large and comfortable with en suite facilities. As I was competing in a triathlon in town I asked if I could have breakfast earlier than advertised and if I would be able to check out later, allowing me time to come back for a shower. Both requests were accommodated with no problem. Really enjoyed this stay. Lydney has excellent facilities, pubs, restaurants and two supermarkets. I wish I had had time to try some of the local walks and visit Chepstow castle. We had a fantastic stay at Helens lovely Bed and Breakfast. Her hospitality was warm and welcoming and it felt like home from home. The room was spotless, very comfortable and the bath was the icing on the cake :).....we are still talking about it. After a great nights sleep we had a delicious cooked breakfast looking out at the wonderful views from Helens breakfast room. We would highly recommend and definitely be back. We would really recommend Dean Valley Panorama. We were looked after really well. the room was clean and the bed was really comfortable. Can understand why it has Panorama in the name as the view was outstanding. We went into Lydney to look around and went into the local fish and chip shop for a meal. Really good with enormous and I mean enormous portions. Lovely situation and view - even on a damp day! Comfortable room and facilities. Good breakfast. Thanks for your welcome. Stayed for one night and Helen made us feel most welcome!The room was lovely and spacious. It was the family room and my son loved the fact that although he was in the same room, he had his own part of the room around a corner. There was tea, coffee, biscuits and all you needed. We sat in the garden area in the evening with a few drinks admiring the lovely view. There was plenty of parking opposite the house. Would book again. Dean Valley was very clean,comfortable and the host welcoming. We had a lovely welcome by Helen, our host. Our suite was spotless and the breakfast set us both up for the entire day! Helen made us very welcome into her home. The room we stayed in was very well presented, immaculately clean and very comfortable. Good selection of fruit, cereals, yoghurt etc as well as full English breakfast. 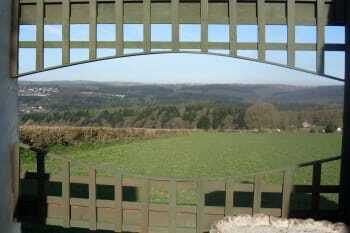 Best of all was the views of the Forest of Dean. Local pub was a good old fashioned place. Served good simple home cooked meals at very reasonable prices. Lovely room, fabulous views, breakfast as you wanted it. Really enjoyed our stay ! Helen has a beautiful house with amazing views. A lovely lady, breakfast was great. Will definitely be on our places to return to. The location is perfect for visiting the Forest of Dean with its many attractions. A wonderful place to stay! The host was very welcoming, the location is idyllic. Many things to do in the area. Glorious views, lovely landlady Helen and very comfy bedrooms with extra toiletries. Breakfast also very nice indeed. A couple of nearby pubs go good food though car ride may be the better option rather than a walk if you don't like hills. Lovely welcoming B&B with really comfortable bed and fabulous views! Excellent B&B - owner lovely and also a good cook! Lovely spotlessly clean room and bathroom. Very comfy bed and very tasty breakfast - what more could you want. Thanks Helen - we will be back I am sure. Beautiful views of the Forest of Dean, as long as it's not foggy!! Great place to stay, very clean, Helen is lovely and went out of her way to help with anything. The accommodation was lovely. There was a warm welcome and Helen was very hospitable. I had everything I needed and the breakfast was delicious. Thank you very much. Calm, friendly welcome. The breakfasts were very good, the nights peaceful - we were very comfortable indeed, and will definitely return. Cafes: In addition to Kaplan's in Lydney, try Lydney Brew (the Whitecross School end of town): good coffee! 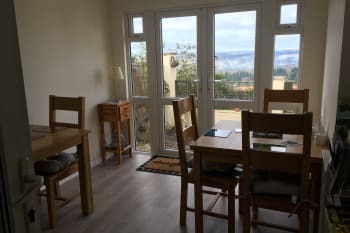 Lovely room, friendly owner, delicious full English breakfast, and a fabulous view of the forest. We would definatley stay again. Wonderful welcome and stay with Helen. Lovely accommodation, and great breakfast. We stayed with our 3yr old - it was helpful having a room that lead off from ours for him to sleep in. The views are stunning and there are parks to play in in surrounding areas. Could have done with an extra pillow but that was a minor consideration. Breakfast was excellent. Lovely B&B if I was that way again I would definitely book. Great staff made sure we had everything we needed. Friendly host,ideal location for exploring the forest,lovely views. Excellent meal at Fountain Inn at Parkend.Symonds Yat and the boat trip. The b&b primes itself on the location with fantastic views of the Dean Forest which our room Blackpool Bridge overlooked. 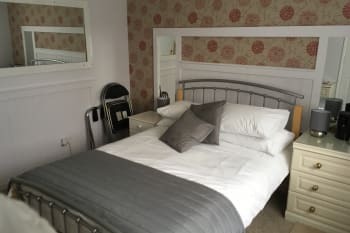 The bedroom was very comfortable being warm, coffee/tea making facilities, iron and board, good shower room with toiletries and with the added space for an extra single bed, which is great for a family. The breakfast was cooked to order which was very good. 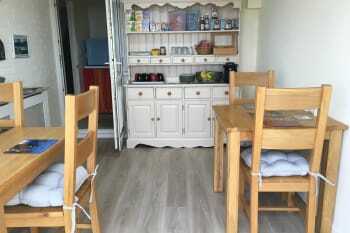 Helen has made a lovely home to home accommodation which we would truly recommend. While there we visited Tintern Abbey and had a cream tea on the Dean Forest Railway. We ate at the Woodman Pub in Parkend, recommended by Helen and the meal was very good. Beatific place, wonderful food, everything you could want! Smallish bedroom but nice comfortable bed with a large ensuite. Good breakfast with a choice of cereals ,yoghurt and jams also the choice of a full English fried breakfast which is highly recommended. Plenty of woodland walks close by , a nice walk about 2 miles away at Mallards Pike. Symmonds Yat is a lovely riverside location with walks, boat trips and the chance too paddle your own canoe. Chepstow a lovely market town close by and certainly worth a visit, if your a seasoned walker there is a lovely walk from Tinton Abbey down to Chepstow about 8 miles with wonderful views. We would definitely stay there again. Thank you for such an enjoyable stop over. I had a very comfortable stay in a room with the biggest bath that I have ever seen- good for a long relaxing soak after a day of walking/cycling and adventure on one of the Forests trails. The room was spotlessly clean with everything I needed. I enjoyed a healthy breakfast of which there was lots of choice. I had a warm welcome from my host. 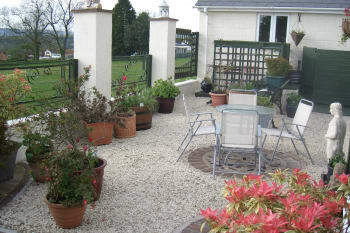 This B&B is in a beautiful location, views are enviable. I am in awe of the forest every time I visit and am newly surprised at the wonder if nature and the activities on offer. Make sure that you have just in case waterproofs in preparation for the odd shower. There are many places to eat out in the area and you need some pre-planning to know where they are. Helen the owner was very helpful prior to our stay giving local taxi information. Very welcoming when we arrived. 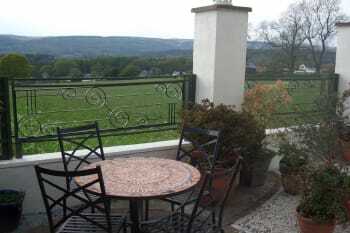 Provides a small fridge for use & the terrace outside to enjoy the views. A small establishment only two rooms both very well kept & the views are exceptional. One room has an amazing double bath, second room great if travelling with a child or third adult an extra bed in the dressing room. Breakfast cooked to your preference. We were made to feel very welcome and Helen provided excellent literature for possible local visits. Our room was lovely, great view, very clean and well appointed with lovely touches such as a cork screw and binoculars. The outside terrace would be lovely to sit with a glass of wine and take in the wonderful view (the weather did not allow us to do this! )....a fridge has very thoughtfully been provided for guests. Helen is very friendly and helpful.... and there are leaflets available to assist you to plan activities/places to visit. Breakfast was fantastic. We will definitely return and recommend to others. The Nags Head was very welcoming to us - the food is basic pub food, but tasty and well priced. They are a cash only pub. We enjoyed visiting Clearwell Caves, Symonds Yat Rock for a fantastic view, a river cruise on the Wye with Kingfisher Cruises and walking through the forest. Lovely location, nice and quiet, outstanding views. Host, Helen, was brilliant. Accommodation has everything a traveler could want and then some. Pub just down the road (drinks only) but no restaurants within walking distance. Helen was a perfect host, room was lovely and breakfast was also spot on. Highly recommend! Very handy location for Symonds Yat,lots of castles nearby to visit and of course walks in the lovely Forest of Dean! Excellent quiet B&B with grand view from rear of property. Charming, very friendly owner. Very helpful. Definite place to revisit. Good base for Forest of Dean exploration. Angidy Valley walk excellent (approx 5 miles, adjacent to Tintern Abbey). Highly recommended. Great B and B. Don't be put off by the fact that when you pull up it appears as a private house? 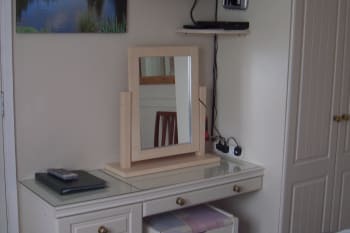 Its set up for Excellent quality B and B. Nice little touches, lovely and clean. Great Breakfast and a lovely host. Very friendly. Pub in walking distance or Nicer eateries a short drive away. Views from the Bedroom to die for. Give it a go, you won't be disappointed. Go on, support the independant, this lady deserves to be successful. I loved it and I often stay in big brand Hotels. I prefer this anyday! on business, so can not comment. Awesome two person bath! Massive!.! Pub a few miles down the road does decent food. Pedalabikeaway/ cannop ponds is 10min drive. Very comfortable stay. Wonderful Panoramic view from the dining room whilst being served with a good hearty breakfast. Plenty of local restaurants to choose from serving home cooked food. There are mapped out walks and cycle hire available. Our host, Helen, went above and beyond for us. Her hospitality was extraordinary. The views from the B&B were lovely and breakfast was wonderful. It a charming and cozy place with lots to eat and lots to offer. I would absolutely travel here again and recommend to a friend. A great place to relax and check out the nearby towns,shops and activities. If you like mountain biking or want a nice walk through the Forrest of Dean, check out pedal away bikes. Great trails, lovely views. 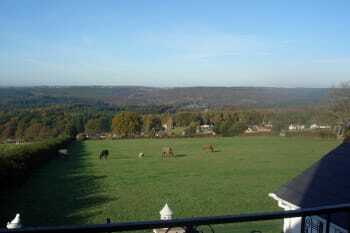 Stunning panoramic views across to the Forest of Dean. Spotlessly clean, comfortable & private with a massive bath. Decorated and furnished to a high standard. Comfortable bed and a good nights sleep for both of us. Excellent breakfast, vegetarian options & friendly host. Dedicated guest parking space. Great location for exploring the Forest. We had a very nice meal in the Rising Sun pub 5 minutes drive away - very generous portions. Thank you, Helen for your hospitality. We have really enjoyed our stay with Ken and Paula. They are very friendly and welcoming and were very happy to organize a gluten free breakfast for my husband. 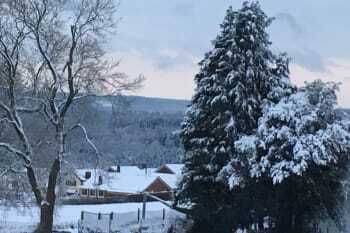 The veiw from the b & b is amazing and very handy for local beauty spots and towns. We enjoyed a walk with Llamas and a nice meal at The Miners Arms which is near the B & b. Couldn't fault. Our every need was catered for and attention to detail was outstanding. Use the guide in the room to help choose where to eat as it is accurate and very helpful. Very friendly owners. They made us very welcome. Rooms where clean and well maintained. Beds where really comfortable. Breakfast tasted excellent. Friendly homely atmosphere, spacious room, extremely clean. Great place to stay. Breakfast was excellent with plenty of food and choices. Followed by nice banter and advice on places to visit. Bike riding and walks in the Forest of Dean first class, rides for all levels. Plenty of things to do and see, we had planned to visit Gloucester, but didn't have time as there is so much locally. A home from home - every need thought of! Dolce Vita in Blakeney excellent restaurant. Paula and Ken were very friendly and made us feel very welcome.They were really helpful and knowledgeable about local attractions .Breakfast was lovely and there was lots of options.We would definitely go back. we found a lovely cafe in Lydney called The Bridge nice people and a very good portions.if you like a walk a trip to Puzzlewood is worth a look.Goodrich castle was ok too and both of these quite affordable. Really lovely stay and very friendly. Lots of useful advice on what to do and where to go. Check out Puzzlewood; the Tapas bar in Coleford and the Speech House Hotel for an excellent meal in grand surroundings. Excellent and friendly service. Lovely accommodation. Great breakfast. No complaints at all. Would recommend a visit to Heritage Centre, very informative about the area and cafe was excellent. Trips into the forest should also not be missed. Very friendly and welcoming. We appreciated the early breakfast, thank you. We had super rooms and facilities. Plenty of choice for breakfast. Thank you for your review. We are glad you enjoyed it despite the not so clement weather. ! The delightfully furnished room with an amazing ensuite, and the breath-taking views over Dean Forest Valley were beyond my expectations. Thank you Ken and Paula for being such excellent hosts, and clearly loving what you do. I will definitely be coming again. A wonderful stay with great hosts that couldn't do enough for me. The view is stunning! Enjoyed the B & B so much, I didn't leave the place for 2 days! As a result, I don't know anything about the local area, other than very pretty and I'm sure there's lots to do! I found Paula and Ken to be wonderful hosts the room was very comfortable,clean and cosy. The cooked breakfast was very tasty and welcome,I like the ambience of the breakfast room and the view was fantastic, the sheep wandering on the road added to the Country visit. The presentation and work involved in the Course was excellent, would definitely go again! There are some interesting shops in the village of Lydney, people very friendly. The local Fountain served bar meals in a relaxed atmosphere. A lovely B&B with 2 lovely hosts. The room was immaculate and everything was catered for. I don't think I have seen such a big bath before! The hosts kindly prepared an early breakfast for me, which was marvellous. A lovely stay and I would have no hesitation in recommending it to others. I would highly recommend the Woodman Inn in nearby Parkend for dinner, especially the curry buffet evening each Thursday. Lovely warm welcome, clean cosy room. Had everything we needed and a delicious breakfast! Ken and Paula were lovely to chat to and knew everything we needed to know! We wanted for nothing! ! Great weekend all round, thank you! We are very appreciative of your review thank you. Hope to see you again sometime perhaps. Very warm welcome. Walking through the gate saw the fantastic views. Lovely breakfast, looking at those views again, even if there was mist over the hills. Enjoyed chatting about the locality, and football. Do hope we get to visit again. We went on the team train and it went through part of the Forest of Dean where the colours were beautiful Went for a walk around Lydney Harbour where there are fantastic views and eerie wrecks of unfortunate ships washed up on the shore. Lovely B&B with great views and friendly hosts. The Forest of Dean is beautiful. I wish I had time to further explore the beautiful woodland which was just turning autumnal. Thank you for taking the time to do a review. If you come next time you may want to book into our other room that has a large shower rather than the large bath and a seating area. Perhaps we could persuade you then to give us a 5 for facilities? It was a pleasure having you as guests. As we reported to the owners we could not fault the b and b. everything about our stay was super and we would thoroughly recommend it to anyone. We are pleased that you enjoyed your stay and are welcome back anytime. Thank you. Just love the woods, Canop Ponds, Mallards Pike etc. Friendly welcome,. Helpful but not intrusive. Beautifully appointed Bed and Breakfast located in a glorious,rural setting. Nothing was too much trouble for the hosts,who have created a wonderfully,relaxed,calming and peaceful B and B. Highly recommended. 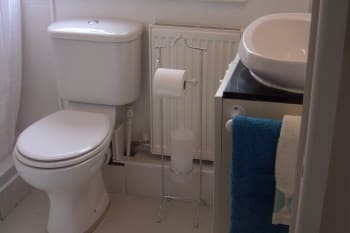 Please bear in mind the location of this lovely,peaceful B and B.....: Allow 10-15 minutes drive to the nearest local pubs which offer a wonderful choice of evening meal,highly recommended with great choice of menu,both of which are situated in the two adjacent villages. Dean Valley B and B has 2 small convenience shops/newsagents,which are both just 5 minutes walk away. The Italian restaurant and The Miners Arms are very good places to eat and are very local to the Panorama. Also the church in the village of Newland "the cathedral in the forest" is certainly worth a visit. Thank you for taking the time to do your review and you have given us a tip. We did not know about the church at Newland. We'll now be visiting it! This is a cracking little B&B. Hosts Paula and Ken have paid meticulous attention to detail, and provide everything you could possibly want. Standards of cleanliness and quality of breakfast unsurpassable. It's Rebecca's parents, and thank you our stay was a pleasant and had a good night rest from our tired journey. Breakfast was yummy, inspite being a little cold. Wonderful welcome, lovely room Mallard's Pike with an enormous bath. Lovely and clean with lots of extras and of a high standard. Lovely breakfast. Visited the Miners Arms PH for a friends party had a wonderful time. Pub full with eaters and drinkers with a good choice of ale. Friendly, unobtrusive and fantastic value for money. We have travelled the world quite extensively and believe the view from here is 'World Class.' If you are not moved by the setting you should probably book an extra couple of nights - as you clearly need a break. Load to see, do and dine. Paula and Ken welcomed us on arrival. We were shown our room and everything explained. Our Breakfast was very nice. Yes we would visit again when in that area. Our meal at the Woodman Public House was very satisfactory. Ken and Paula made us feel very welcome. They could also answer our many questions regarding places to visit and eat. Symonds Yat is well worth a visit including the walk down to the river, although not easy and even harder coming back up!!!! Gloucester Keys has a few restaurants and is quite an attractive area if one enjoys small waterways and warehouse conversion architecture + a few attractive barge boats that people are living on. Great views. Lovely and clean room. I would advise booking restaurants in advance, specially on Saturdays. We thoroughly enjoyed our three night stay. We were made to feel very welcomed. My husband had only one negative and that was due to being in his mid seventies he did find the bed a little hard, as we have just purchased a new mattress he is used to a much softer mattress, he did sleep very well though, perhaps a mattress topper would help people of a more mature age!! We will definitely be booking again, when we travel down to the Forest of Dean. We went out for dinner to La Dolca Vita an Italian restaurant where we had excellent food the wine per glass was quite pricey,perhaps cheaper to buy a bottle, staff very efficient and friendly. We also went to The Miners and the food was superb although there is the noise from the pub clients,again the staff were very friendly and helpful. A trip to Puzzle Wood,Clearwell Caves, and Symonds Yat are a must. Thank you for your great response and we note your comments on the bed. There is already a memory foam mattress topper - perhaps it needs to be thicker? The bed in our double room is softer for those who prefer softer mattresses. We look forward to seeing you again. Proprietors on site who were very helpful and friendly. Ideal location for touring Forest of Dean and Wye Valley. Quiet rural community. Good restaurants within few miles. What a hidden gem! 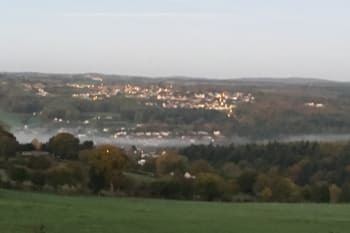 The B&B views are spectacular, hosts friendly and accommodating, room extremely high standard with every amenity you could need and breakfast (especially sausages) delicious. We highly recommend, for couples or families. Many thanks Paula & Ken! Ken and Paula very welcoming. Fab double bath in Mallard Pikes room. Great view. Would highly recommend and stay here again. Ugly Duckling restaurant very good. Puzzle Wood fantastic place to visit. We were made to feel most welcome by Ken and Paula the owners. They were both a font of knowledge on places to visit and couldn't be more helpful. Level of service was higher than that of a recent hotel stay. The views from the property are outstanding. I can't reccomend highly enough a stay here. Take time to visit puzzlewood. Magical mystical place. Lydney harbour, a nugget of histroical history. Clearwell caves - definately made you realise how lucky we are as a generation not to have experienced what our forefathers did. Symonds Yat- do take binoculars and a good camera!!! I am on a gluten free diet, this was confirmed to Dean Valley & was taken care of by them perfectly. Very comfortable. Friendly owners. Very clean. Lovely views. Good breakfasts. Front room (superior) has great views from the window. Wonderful hosts, extremely helpful and friendly. The bedroom and bathroom were spotlessly clean. Lots of little extras like wine glasses in your room, everything has been thought of! The double bath is a perfect place to relax after a long day's walking. Fantastic breakfast and spectactular views. Warm welcome, rooms well furnished & equipped with everything you need. Fabulous views. Peaceful night sleep & good choice of breakfast. Would definitely recommend. Miners arms well worth a visit for evening meal. Warm welcome, extremely friendly and helpful with local knowledge. Excellent facilities, spotlessly clean. Superb breakfast, lots of choice and very high quality. As good as any 4 star hotel! There is a great pub in Whitecroft, the next village, The Miners Arms... excellent food and real ale. Ken and Paula were very welcoming, friendly and obliging. The room was spacious and there were lots of extra touches to make the stay special and comfortable. Breakfast was generous and excellent with nice crispy bacon. Warm welcome. Paula greeted us with a tray of tea and cakes. We stayed in the Blackpool Bridge room which was tastefully decorated. There was plenty of tea & coffee and lovely biscuits, also bottled water on arrival. Large shower in the annexe room which also had a panoramic view over the corn field, down to the Forest of Dean and beyond. Plenty of choice for breakfast. Ken &bPaula were very helpful with places to eat and places of interest to visit. All in all we spent a very relaxing two nights in the B&B. We eat in the Dolce La Vita in Blakeney a newly opened Italian restaurant. The food was delicious with excellent service. Just simply brilliant. Great room. Fabulous breakfasts. Friendly service. Fantastic view and great local knowledge. Brought stay to life. I thought Ken and Paula were very welcoming and and ever effort to make us feel at home. They helpfully lent us a local OS map and Guidebook. We very much enjoyed our stay with them. A good base from which to explore the Forest of Dean and wider area. We had a lovely stay. We felt the B&B was run professionally but in a friendly manner. We liked our room and its decor. The double bath was great, I did notice some bath salts, but it would have been nice to have had some bubble bath. Go boar hunting! The woods were carpeted with bluebells which was lovely. The Rising Sun Inn was a nice place for a meal- we sat outside by the pond. Very friendly and professional personalized service. Felt like a good friend visiting. Nice and tasteful furnished rooms. Very good breakfast. Service of a good hotel combined with the friendliness of a B&B. Nice country site not far away from Lydney. Recommended for business travelers wanting to try something different and of course for private travel. Nice pub was appr. 20 minutes walking distance or 4 minutes driving. If you walk please take the torch light when you walk back at night. Food in the pub was ok but not great. Ken and Paula were wonderful! They were very sweet and helpful, and the quality of their service was of an extremely high standard. Go to the nearby village Park End! And walk lots! Lovely welcoming couple, facilities are spotless and put tge personal touch to your stay. A variety to choose from for breakfast and all locally sourced. Amazing view from the breakfast room which I could happily admire for hours. Centrally located for varies activities and only 30 mins from Gloucester. Considering you only have 2 rooms and are cooking breakfast fresh I don't understand why you have to request detailed information the day before, a more informal approach in the morning would have suited us better. Breakfast itself was adequate, but a Bed and breakfast can live or die by it's breakfast more attention to detail, e.g. poached eggs should be properly poached and not steamed in a "poacher"
Good location and we're very pleased with the owners cares. This B&B is located at a key location easily reachable to nice natural beauty. Both Way valley and Dean Vally attractions are near to this place. We thoroughly enjoyed our stay. The house is ideally situated and is very comfortable. They have added many nice touches in the room. The views across the rolling hills and forest from the Superior room, breakfast room and patio are lovely. Ken and Paula went out of their way to make our stay special but gave us our space as well. The Wye valley and especially Tintern and the Abbey are very scenic. The Angel Inn there does 2 for 1 meals Mon-Thurs. Fantastic deal and meal. 2 miles down river the 365 steps are a tough climb but the view at the top is worthwhile. Kings Tandoori in Lydney serves a delicious, big meal for a good price. Lovely and perfect in every way! A small bed and breakfast with very friendly owners who made sure we had a great stay. A comprehensive breakfast from cereals and full English with fruit juices and tea and coffee. Superb in room tea making facilities, comfy beds, good hot shower and stunning views. Not right in the action so keen walkers and car owners only. However, I did see a bus stop nearby so that could be an option. Ideal for the Forest Of Dean and 45 minutes from Slimbridge Wildlife. Very tranquil. Thank you for going the extra mile and photocopying the walk for us (even putting it in a plastic sleeve). We had a great walk on Sunday (the 6 mile one in your guide book, starting at Mallards Pike and round a ridge) and noticed how nice it was to walk on the path as it wasn't muddy; even after all the rain we had. Where we live, the paths become very muddy and slow going in the winter, so it's a good winter destination for walkers.